We're in the thick of festival season these days, though it's yet to reach its peak, which means there's lots of Indigenous gatherings, powwows and performances to check out. 1. CreeFest July 13-17 - Crystal Shawanda headlines Saturday night during this 5 day festival of Cree culture in Masonee, Ontario. Event info: CreeFest. 3. Folk on the Rocks July 14-17 - “the North’s biggest party under the midnight sun” features an array of Indigenous artist in their fantastic lineup. Read our full post on the fest here. 4. Dawson City Music Festival July 15-17 - Also in the north, Dawson is having "tiny, perfect festival" this weekend which includes performances from Tanya Tagaq. Full line-up: Dawson City Music Festival. 6. Kla-how-eya Aboriginal Centre Powwow July 16-17 - The 2nd annual powwow takes place in Surrey, BC, at the same time and place as the Fusion Festival. More info: SACSBC. 7. Great Northern Arts Festival July 15-24 - Canada's oldest and largest northern arts event fills ten days with culture, art, performance and workshops at the Midnight Sun Recreation Complex, Inuvik, NWT. 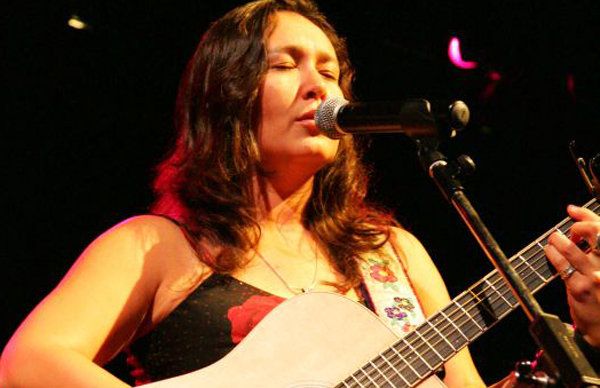 Laura Vinson performs July 16, M.O. performs on July 21. Event info: Great Northern Arts Festival. 8. Northern Roots Music Fesitval July 13-14 - Wednesday features Metal acts, Thursday is Hip Hop and Friday's line-up is Rock-Pop at The Pas, Opaskwayak, MB. The lineup is extensive but includes Derek Miller, Leanne Goose, Joey Stylez, DJ Whitecloud, Ninjaspy, Soulless Icon, Wreckening and a lot more. More info: Northern Roots Music Festival. 9. Vancouver Folk Festival July 15-17 - Digging Roots and Samantha Crain are both at this ocean-side festival this weekend. Full lineup: Vancouver Folk Festival. 10. Scugog Island First Nation Powwow July 16-17 - Each day of the 15th Annual Tradition Powwow starts with a sunrise ceremony. Get your powwow on from dawn 'til dusk in Port Perry, ON. Event info: Scugog First Nation.